Many non-complex standard components are sold in tens or even hundreds of millions and consequently there is a great deal of competition to plastic injection molds making company and sell them. In view of this，the plastic molder has to adopt a highly efficient, cost-effective production method to stand any chance of succeeding. Shallow boxes, cassette cases, video cases and Petri dishes are examples of this type of part. Such components often have large projected areas that would mean having to use large machines to produce them. Clearly it would be a distinct advantage if the moulder could mould these on a smaller machine, thus lowering the cost of production considerably. In normal circumstances the machine locking force is determined by multiplying the projected area of the parts by the injection pressure. 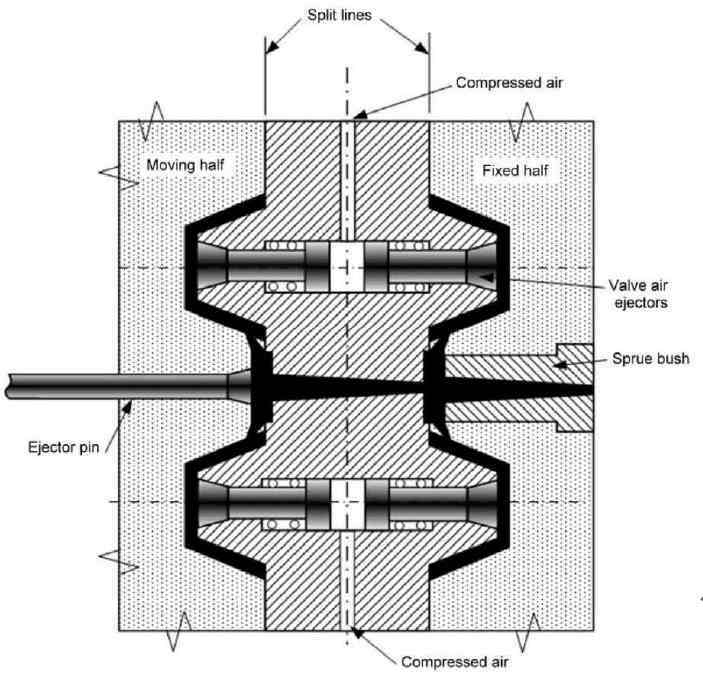 In Figure 1. we examine what happens when one component is placed directly beneath the other, to see how this affects the locking force requirements. By definition, the projected area is the area of the moulding seen when looking down on the plastic injection molds in the direction of injection. 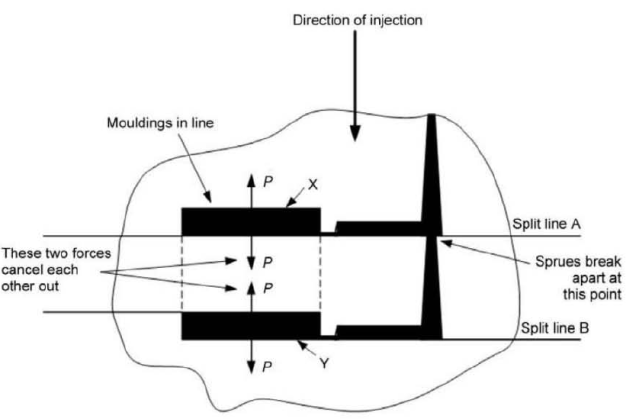 Here we can see that the two projected areas of mouldings X and Y coincide; thus the projected area for moulding two components in line is the same as for moulding one. Looking at the situation from the point of view of simple physics, we can consider the forces acting on the plastic injection molds. We can see that the forces P trying to open the plastic injection molds are the same for both cavities. Adding these forces algebraically^ the resultant force is simply P. This is the result of equal and opposite forces cancelling each other out. Either way, the net result of moulding two parts having the same in-line projected areas is that the total projected area is the same as for moulding one part. Note that the only requirement here is that the projected areas are in-line and of the same value: different parts may be moulded in this way provided these conditions are met. 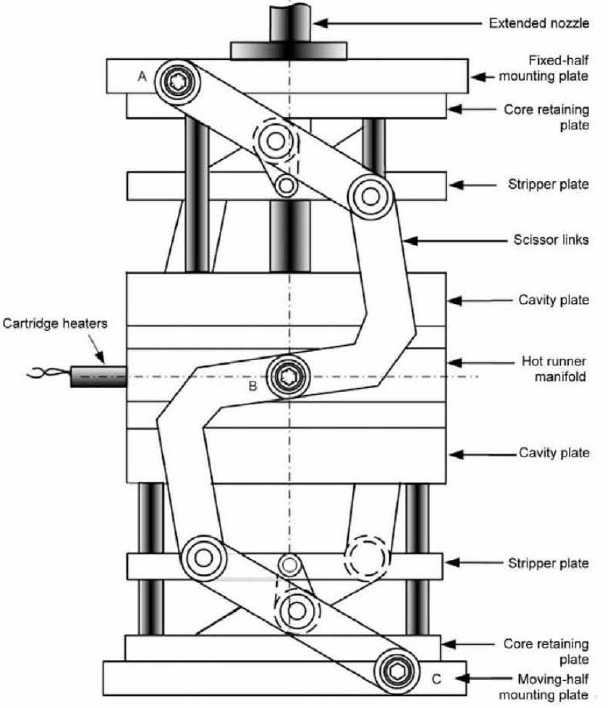 Figure 2. shows the basic construction of a typical stack plastic injection molds. In this ease, the plastic injection molds design is based on a cold runner system where the upper set of cavities is fed via a sprue in the normal way, while the lower set of cavities is fed by a sprue extension. The interface between the two sprues is designed so that the lower one breaks away from the upper one as the tool opens as shown. In this design, the components are placed so that they may be ejected by means of air ejectors placed in the plate carrying the common cores. These are returned to their starting position via springs. In practice it is far more usual to use a hot runner approach on stack moulds for obvious reasons. With such large quantities, the hot runner offers advantages of faster cycling, fewer rejects and more consistent production. 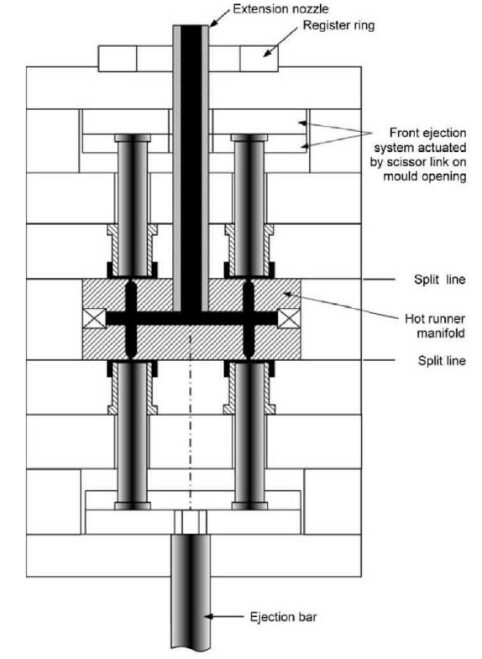 Figure 3. shows a basic stack plastic injection molds design with a hot runner system. 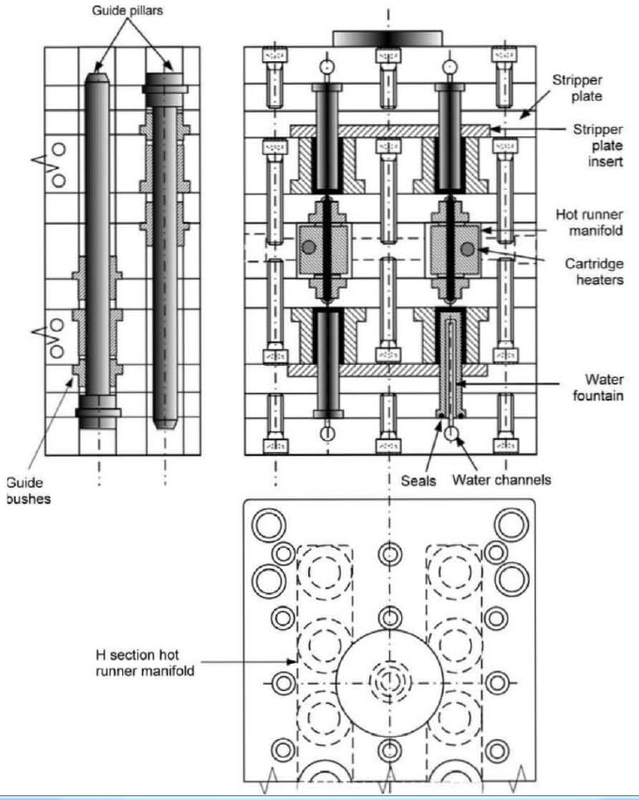 Figures 4. and Figures 5. show an eight-impression stack mould moulding polypropylene cover components with a full hot runner system. In Figure 4. the scissor links are screwed to the plastic injection molds plates where indicated at A, B and C hut are free to rotate as the plastic injection molds opens and closes. The remaining joints are also free to rotate but not attached to the plastic injection molds. Note also that the position of the scissor link is reversed on the other side of the plastic injection molds to prevent out-of-balance forces and ensuring a more even actuation of the stripper plates. Note the very long guide pillars that are required to provide location for the mould throughout its long opening stroke (Figure 5). Since stack moulds are used for producing very large quantities of components, high-quality alloy plastic injection molds steels should be used throughout the construction. Additionally as these plastic injection molds normally run continuously, provision must be made for an adequate lubrication system 一 preferably automatic.